Mysore Pak is a South Indian traditional dessert prepared and served in all festivals especially Diwali. It is also sometimes served with the Thali meal in weddings and restaurants as a sweet dish. There are two types of Mysore pak in my point of view & they depend on texture. One is Ghee Mysore Pak which is soft & melts in the mouth and with smooth texture while the other one is normal the Mysore pak which is slightly hard when compare to ghee mysore pak, has a porous texture and dark brown centre with light coloured edges. Perfectly made Mysore pak tastes heavenly. If it goes wrong it will be hard like a brick. It is an super easy dessert if you know the tricks to make it. 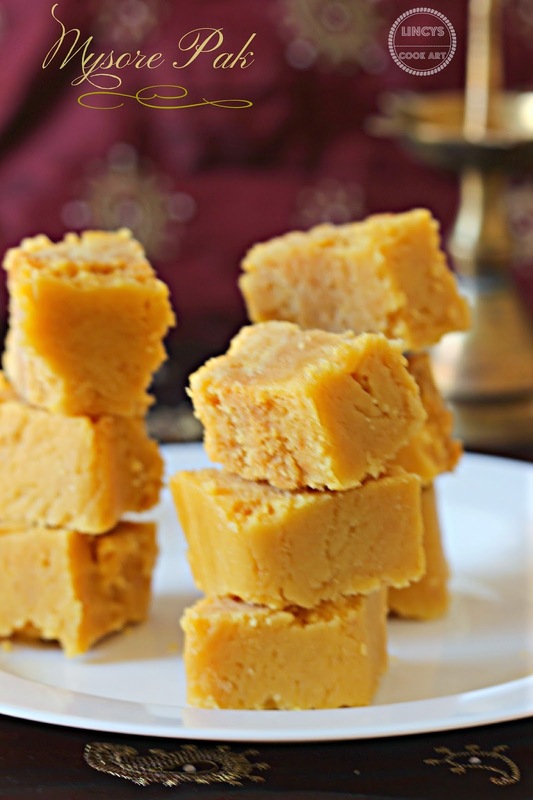 Here i have shared the tips that i have learnt while making the mysore pak. Apply ghee in a square or rectangular tin with depth around 3- 4 inches (the depth of pan is important to get the nice brown colour at the middle with yellow edges and for the porous texture) set aside. Sieve the gram flour if the pack is already opened otherwise not necessary; set aside. Add the ghee with oil together in a pan and heat reduce the flame(4:1 ratio. Ghee for flavour and oil for texture). While adding this should be really hot. Now start adding the Gram flour 1/4 cup at a time by constant stirring by breaking the lumps once the flour dissolves in syrup add next lot likewise add the whole 2 cups and constantly stir it. Now start adding the hot ghee 1-2 tablespoon at a time into the gram flour syrup mixture. Stir well continuously till last stage without break. Atone stage the mixture does not stick on the pan and become frothy bubbly and looks pale Allow to bubble the mixture around two minutes or till u get the roasted smell of the gram flour. Flatten the surface with a backside of the spoon dipped in ghee. Do not apply pressure while flatten the surface. Draw the marker lines on top of mysore pak after 10 minutes. Do not give deep cuts. Further cool down 10 more minutes to give deep cuts (mysore pak still will be hot). When you cut the mysore pak it should not stick on the knife. It is the perfect heat for the mysore pak to give deep cuts. Donot separate them now because it tend to break. Once it almost cools down around 20 minutes after transfering separate the cut pieces. To make the pan full of mysore pak 8x8x3 size pan you will require 5 cups of gram flour, 5 cups of sugar and add ghee half a cup more i.e 1.5 cups of ghee and 1/2 a cup of oil. So if you are planning to prepare in a big batch you will get more deeper colour mysore pak. Note: Continuous stirring is essential from starting to finishing stage. See my Porous slightly brown centered Mysore Pak!!! What a perfect texture........ Looks awsum ! Mouthwatering Mysore pak.. Made to perfection.